Do you provide health education or health care services to adolescents and emerging adults with asthma? Are you looking for health education materials and resources focused on indoor environmental asthma triggers for adolescents and emerging adults? If so, DeAndra Morris, an ASPPH/EPA Environmental Health Fellow hosted by the U.S. Environmental Protection Agency, Indoor Environments Division, has created the "It's Asthma" Infographic Series as part of her participation and training in the ASPPH Public Health Fellowship Program.This infographic series can assist you in your efforts to provide information about indoor environmental asthma triggers to adolescents and emerging adults with asthma. Source: Centers for Disease Control and Prevention. (2018). In this infographic series, adolescence is defined as the developmental period between childhood and adulthood that roughly occurs from the ages of 10-18 years old. 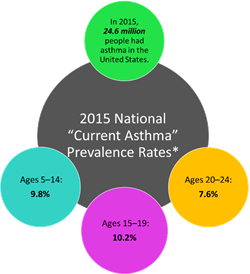 The data from the Centers for Disease Control and Prevention (CDC) 2015 and 2016 National Current Asthma Prevalence Rates include age group categories of 15-19 and 20-24, which represent these adolescence and emerging adulthood developmental periods. The CDC 2015 National Current Asthma Prevalence Rates data indicated that adolescents and emerging adults had the highest and fourth highest current asthma prevalence rates, respectively, among all other age groups. The recently published CDC 2016 National Current Asthma Prevalence Rates* data also indicates a high current asthma prevalence among these populations, with adolescents and emerging adults having the second and third highest current asthma prevalence rates, respectively, among all other age groups. The high current asthma prevalence among adolescents and emerging adults suggests that there may be a need for tailored asthma health education materials targeted toward adolescents and emerging adults with asthma, specifically for those between the ages of 15-24. A review of literature shows that there are many asthma health education resources and materials for children, but there are limited asthma health education resources and materials tailored and targeted towards adolescents and emerging adults. "It's Asthma" is a tailored health education resource targeted toward adolescents and emerging adults with asthma that provides information about indoor environmental asthma triggers and strategies to reduce exposure to these triggers. "It's Asthma" consists of six infographics that focus on five common indoor environmental asthma triggers (i.e., secondhand smoke, pets, mold, dust mites, and pests), and can be used to assist adolescents and emerging adults with their asthma management. There are two versions of the series-the long form and short form. The long form provides more details about each trigger and is available in a color format and a black and white format that can be used for black and white printing. Additionally, the short form version of the document can be used for initial engagement through social media posts, brochures, etc.Consider using the "It's Asthma" Infographic Series as you work to promote asthma management among adolescents and emerging adults with asthma!